Glenn's Gases is a Minecraft mod that adds a variety of gases into your Minecraft world. If you think the addition of gases will barely affect your Minecraft experience, you are very wrong... Glenn's Gases is for the survivial players who seek a new way of refreshing the survivial aspects of Minecraft with both new challenges and solutions. In real life mining, gases can be extremely dangerous. Some gases are very toxic, some are flammable, and some are even explosive. Even coal dust can cause major problems. Some of these gases may be hard to detect, because they can be colorless and/or odorless. To avoid certain doom, miners have to take safety precautions. You might want to do so too. Generated gas pockets! They don't surface in the caves, so you'll only find them if you dig for them. Scary gas fires and ground-shaking gas explosions! Deadly steam! You should probably be careful around water and lava. Lanterns! They might look fancy but they are also vital to your survival! Gas Furnaces! They're faster, and can smelt a whole stack of coal into a diamond! Gas Dynamos! 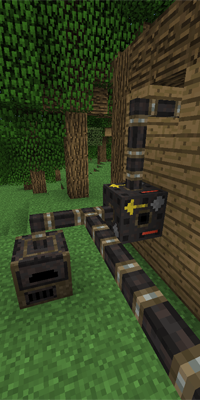 Generate RF (Redstone Flux) using flammable gases. There are more features, but I encourage you to find out for yourself by trying, then either succeeding or failing! If you want to find out about everything beforehand, I won't stop you. In Glenn's Gases, lanterns are invaluable. Common sense dictates that open flames (torches) are not ideal in caves where the walls can be riddled with flammable gases. Lanterns are the solution to this problem; You can place torches inside a lantern at the cost of some light range, or place bottles of gas in them to make them burn at full brightness for a long time! They can be placed inside lanterns by either right clicking on it with the item, or by putting an empty lantern and the item on a crafting table. Glowstone lanterns are the only full-bright lanterns that will last forever. Piping isn't easy, and doing it wrong may result in leakage, fire, explosions and/or death! What you generally want to do is use a gas collector to collect the gas and put it into pipes. However, a gas collector can only pump gas through a limited length of pipes. If you want to pump it longer than that, you have to use Gas Pumps to provide additional pressure. Use properly rated pipes that can handle the pressure. If you want to pump or collect gases of specific types, you can right click an airborn gas with a sampler, then right click with this sampler on the pump/collector. You might want to store this gas somewhere. That's what you have tanks for. Gas can also be stored in Gas Bottles, which can be filled with a a Gas Transposer. These Gas Bottles can be placed inlanterns to produce light for varying periods of time. Some gases are more efficient as fuel than other gases. To use the gas for other purposes than lighting, try pumping it into a Gas Furnace or a Gas Dynamo. The Gas Furnace has an unique temperature mechanic; Smelting an item will increase the furnace temperature, which in turn will cause items to smelt faster. Gas consumption remains the same no matter what the temperature is, meaning you can save gas by using a speedy warm furnace. Gas Dynamos allow you to produce RF (Redstone Flux) using combustible gases. More detailed information on piping can be found in the Information Database. Smoke and ignited gas - Necessary for flammable gases. Igntition block registration - Register/unregister blocks as flammable.